Pallas Kunaiyi-Akpanah leaps for the rebound. The freshman forward's 14 rebounds on Saturday marked the seventh time this season she's reached double-digit boards. On the first possession of the game, senior guard Maggie Lyon’s 3-point attempt rimmed out. Pallas Kunaiyi-Akpanah leapt in the air, grabbed the rebound and easily converted a layup to give Northwestern a 2-0 lead. That play was just the beginning of a big day for the freshman forward and the rest of the Wildcats. Kunaiyi-Akpanah picked up her third career double-double with 10 points and 14 rebounds, and NU (15-13, 4-12 Big Ten) never trailed in cruising past Wisconsin (7-19, 3-13) 71-53 on Saturday afternoon. The Cats have struggled to win games this season when they aren’t hot from long range. 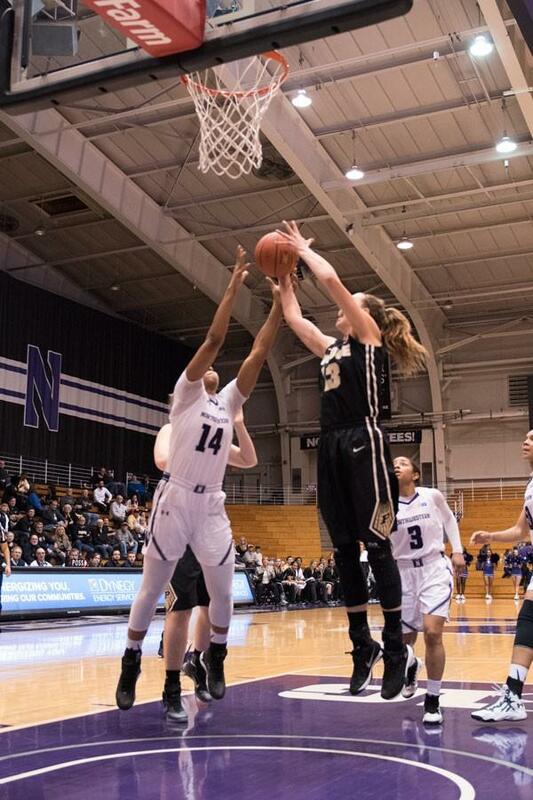 On Saturday, NU hit just three 3s but dominated the paint with physical play led by Kunaiyi-Akpanah. Her play was key in giving the Cats a 39-30 rebounding advantage over the Badgers and a 42-26 advantage in points in the paint. Of her 14 rebounds, eight came on the offensive end. Kunaiyi-Akpanah crashed the boards seemingly every time an NU player shot and used her athleticism and positioning to give the Cats extra scoring opportunities. NU finished with 21 second chance points, many of which came after Kunaiyi-Akpanah kept a possession alive. Kunaiyi-Akpanah’s development has been a bright spot in an otherwise lost season for the Cats. Always a talented rebounder because of her size and strength, the freshman has made major strides in her offensive skill set during conference play. After scoring just 13 total points in the season’s first 16 games, Kunaiyi-Akpanah is averaging 5.8 points per game over the last 12 contests. That includes efforts of 14 points against Ohio State, 13 against Minnesota and her 10 points against the Badgers. Kunaiyi-Akpanah said it’s all about gaining confidence with the ball in her hands. Kunaiyi-Akpanah has expanded her offensive game, knocking down midrange shots as well as making layups. With NU’s lead at just 6 at halftime, she hit a jumper to start the third quarter and launch an 11-2 run that blew the game open for the Cats. “She set the tone for us (today),” McKeown said.